Maybe Newtonian physics doesn’t need dark matter to work, but Mordehai Milgrom instead. 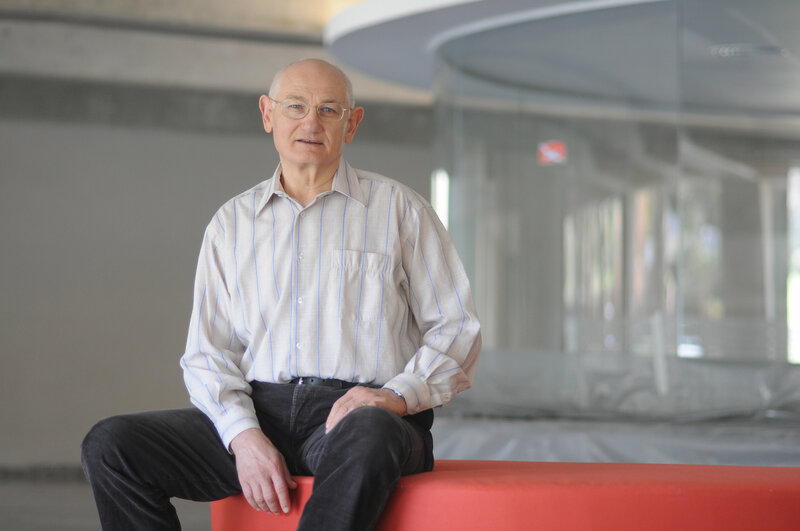 He is one of those dark matter people,” Mordehai Milgrom said about a colleague stopping by his office at the Weizmann Institute of Science. Milgrom introduced us, telling me that his friend is searching for evidence of dark matter in a project taking place just down the hall. “There are no ‘dark matter people’ and ‘MOND people,’” his colleague retorted. “I am ‘MOND people,’” Milgrom proudly proclaimed, referring to Modified Newtonian Dynamics, his theory that fixes Newtonian physics instead of postulating the existence of dark matter and dark energy—two things that, according to the standard model of cosmology, constitute 95.1% of the total mass-energy content of the universe. This friendly incident is indicative of (“Moti”) Milgrom’s calmly quixotic character. There is something almost misleading about the 70-year-old physicist wearing shorts in the hot Israeli summer, whose soft voice breaks whenever he gets excited. Nothing about his pleasant demeanor reveals that this man claims to be the third person to correct Newtonian physics: First Max Planck (with quantum theory), then Einstein (with relativity), now Milgrom. This year marks Milgrom’s 50th year at the Weizmann. I visited him there to learn more about how it feels to be a science maverick, what he appreciates about Thomas Kuhn’s The Structure of Scientific Revolutions, and why he thinks dark matter and dark energy don’t exist. What inspired you to dedicate your life to the motion of stars? I remember very vividly the way physics struck me. I was 16 and I thought: Here is a way to understand how things work, far beyond the understanding of my peers. I was drawn to the beauty of finding deeper reasons for events, to the aesthetics of discovering hidden symmetries. It wasn’t a long-term plan. It was a daily attraction. I simply loved physics, the same way other people love art or sports. I never dreamed of one day making a major discovery, like correcting Newton. I had a terrific physics teacher at school, but when you study textbook material, you’re studying done deals. You still don’t see the effort that goes into making breakthrough science, when things are unclear and advances are made intuitively and often go wrong. They don’t teach you that at school. They teach you that science always goes forward: You have a body of knowledge, and then someone discovers something and expands that body of knowledge. But it doesn’t really work that way. The progress of science is never linear. How did you get involved with the problem of dark matter? Toward the end of my Ph.D., the physics department here wanted to expand. So they asked three top Ph.D. students working on particle physics to choose a new field. We chose astrophysics, and the Weizmann Institute pulled some strings with institutions abroad so they would accept us as postdocs. And so I went to Cornell to fill my gaps in astrophysics. After a few years in high energy astrophysics, working on the physics of X-ray radiation in space, I decided to move to yet another field: The dynamics of galaxies. It was a few years after the first detailed measurements of the speed of stars orbiting spiral galaxies came in. And, well, there was a problem with the measurements. To understand this problem, one needs to wrap one’s head around some celestial rotations. Our planet orbits the sun, which, in turn, orbits the center of the Milky Way galaxy. Inside solar systems, the gravitational pull from the mass of the sun and the speed of the planets are in balance. By Newton’s laws, this is why Mercury, the innermost planet in our solar system, orbits the sun at over 100,000 miles per hour, while the outermost plant, Neptune, is crawling at just over 10,000 miles per hour. Now, you might assume that the same logic would apply to galaxies: The farther away the star is from the galaxy’s center, the slower it revolves around it; however, while at smaller radiuses the measurements were as predicted by Newtonian physics, farther stars proved to move much faster than predicted from the gravitational pull of the mass we see in these galaxies. The observed gap got a lot wider when, in the late 1970s, radio telescopes were able to detect and measure the cold gas clouds at the outskirts of galaxies. These clouds orbit the galactic center five times farther than the stars, and thus the anomaly grew to become a major scientific puzzle. One way to solve this puzzle is to simply add more matter. If there is too little visible mass at the center of galaxies to account for the speed of stars and gas, perhaps there is more matter than meets the eye, matter that we cannot see, dark matter. MOND in the MakingMilgrom’s notes from 1981. 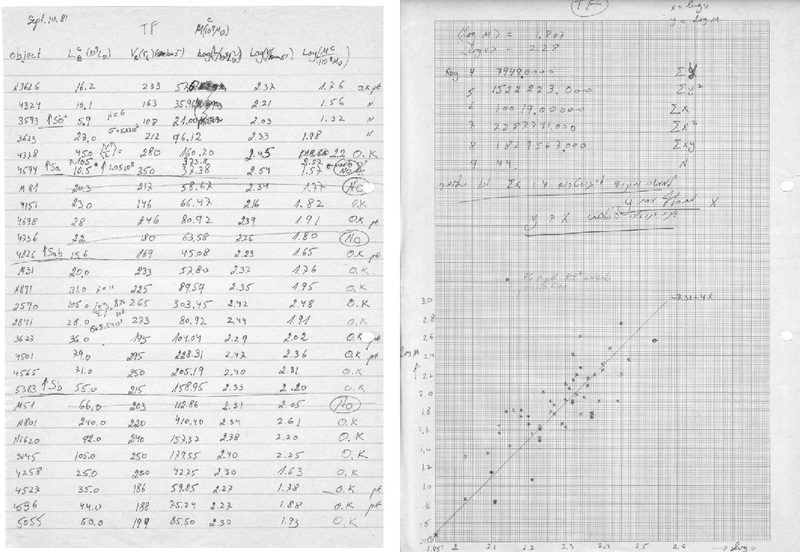 On the left, each line represents the data from a separate galaxy. On the right is the MOND prediction, which is the line going through the data points. What made you first question the very existence of dark matter? What struck me was some regularity in the anomaly. The rotational velocities were not just larger than expected, they became constant with radius. Why? Sure, if there was dark matter, the speed of stars would be greater, but the rotation curves, meaning the rotational speed drawn as a function of the radius, could still go up and down depending on its distribution. But they didn’t. That really struck me as odd. So, in 1980, I went on my Sabbatical in the Institute for Advance Studies in Princeton with the following hunch: If the rotational speeds are constant, then perhaps we’re looking at a new law of nature. If Newtonian physics can’t predict the fixed curves, perhaps we should fix Newton, instead of making up a whole new class of matter just to fit our measurements. If you’re going to change the laws of nature that work so well in our own solar system, you need to find a property that differentiates solar systems from galaxies. So I made up a chart of different properties, such as size, mass, speed of rotation, etc. For each parameter, I put in the Earth, the solar system and some galaxies. For example, galaxies are bigger than solar systems, so perhaps Newton’s laws don’t work over large distances? But if this was the case, you would expect the rotation anomaly to grow bigger in bigger galaxies, while, in fact, it is not. So I crossed that one out and moved on to the next properties. I finally struck gold with acceleration: The pace at which the velocity of objects changes. We usually think of earthbound cars that accelerate in the same direction, but imagine a merry-go-round. You could be going in circles and still accelerate. Otherwise, you would simply fall off. The same goes for celestial merry-go-rounds. And it’s in acceleration that we find a big difference in scales, one that justifies modifying Newton: The normal acceleration for a star orbiting the center of a galaxy is about a hundred million times smaller than that of the Earth orbiting the sun. For those small accelerations, MOND introduces a new constant of nature, called a0. If you studied physics in high school, you probably remember Newton’s second law: force equals mass times acceleration, or F=ma. While this is a perfectly good tool when dealing with accelerations much greater than a0, such as those of the planets around our sun, I suggested that at significantly lower accelerations, lower even than that of our sun around the galactic center, force becomes proportional to the square of the acceleration, or F=ma2/a0. To put it in other words: According to Newton’s laws, the rotation speed of stars around galactic centers should decrease the farther the star is from the center of mass. If MOND is correct, it should reach a constant value, thus eliminating the need for dark matter. What did your colleagues at Princeton think about all this? I didn’t share these thoughts with my colleagues at Princeton. I was afraid to come across as, well, crazy. And then, in 1981, when I already had a clear idea of MOND, I didn’t want anyone to jump on my wagon, so to speak, which is even crazier when you think about it. Needless to say,” he laughs, “no one jumped on my wagon, even when I desperately wanted them to. Well, you were 35 and you proposed to fix Newton. Why not? What’s the big deal? If something doesn’t work, fix it. I wasn’t trying to be bold. I was very naïve at the time. I didn’t understand that scientists are just as swayed as other people by conventions and interests. Like Thomas Kuhn’s The Structure of Scientific Revolutions. I love that book. I read it several times. It showed me how my life’s story has happened to so many others scientists throughout history. Sure, it’s easy to make fun of people who once objected to what we now know is good science, but are we any different? Kuhn stresses that these objectors are usually good scientists with good reasons to object. It is just that the dissenters usually have a unique point of view of things that is not shared by most others. I laugh about it now, because MOND has made such progress, but there were times when I felt depressed and isolated. What’s it like being a science maverick? By and large, the last 35 years have been exciting and rewarding exactly because I have been advocating a maverick paradigm. I am a loner by nature, and despite the daunting and doubting times, I much prefer this to being carried with the general flow. I was quite confident in the basic validity of MOND from the very start, which helped me a lot in taking all this in stride, but there are two great advantages to the lingering opposition to MOND: Firstly, it gave me time to make more contributions to MOND than I would had the community jumped on the MOND wagon early on. Secondly, once MOND is accepted, the long and wide resistance to it will only have proven how nontrivial an idea it is. By the end of my sabbatical in Princeton, I had secretly written three papers introducing MOND to the world. Publishing them, however, was a whole different story. At first I sent my kernel paper to journals such as Nature and Astrophysical Journal Letters, and it got rejected almost off-hand. It took a long time until all three papers were published, side by side, in Astrophysical Journal. The first person to hear about MOND was my wife Yvonne. Frankly, tears come to my eyes when I say this. Yvonne is not a scientist, but she has been my greatest supporter. The first scientist to back MOND was another physics maverick: The late Professor Jacob Bekenstein, who was the first to suggest that black holes should have a well-defined entropy, later dubbed the Bekenstein-Hawking entropy. After I submitted the initial MOND trilogy, I sent the preprints to several astrophysicists, but Jacob was the first scientist I discussed MOND with. He was enthusiastic and encouraging from the very start. Slowly but surely, this tiny opposition to dark matter grew from just two physicists to several hundred proponents, or at least scientists who take MOND seriously. Dark matter is still the scientific consensus, but MOND is now a formidable opponent that proclaims the emperor has no clothes, that dark matter is our generation’s ether. So what happened? As far as dark matter is concerned, nothing really. A host of experiments searching for dark matter, including the Large Hadron Collider, many underground experiments and several space missions, have failed to directly observe its very existence. Meanwhile, MOND was able to accurately predict the rotation of more and more spiral galaxies—over 150 galaxies to date, to be precise. All of them? Some papers claim that MOND wasn’t able to predict the dynamics of certain galaxies. That’s true and it’s perfectly fine, because MOND’s predictions are based on measurements. Given the distribution of regular, visible matter alone, MOND can predict the dynamics of galaxies. But that prediction is based on our initial measurements. We measure the light coming in from a galaxy to calculate its mass, but we often don’t know the distance to that galaxy for sure, so we don’t know for certain just how massive that galaxy really is. And there are other variables, such as molecular gas, that we can’t observe at all. So yes, some galaxies don’t perfectly match MOND’s predictions, but all in all, it’s almost a miracle that we have enough data on galaxies to prove MOND right, over and over again. Your opponents say MOND’s greatest flaw is its incompatibility with relativistic physics. In 2004, Bekenstein proposed his TeVeS, or Relativistic Gravitational Theory for MOND. Since then, several different relativistic MOND formulations have been put forth, including one by me, called Bimetric MOND, or BIMOND. So, no, incorporating MOND into Einsteinian physics is no longer a challenge. I hear this statement still made, but only from people who parrot others, who themselves are not abreast with the developments of the last 10 years. There are several relativistic versions of MOND. What remains a challenge is demonstrating that MOND can account for the mass anomalies in cosmology. Another argument that cosmologists often make is that dark matter is needed not just for motion within galaxies, but on even larger scales. What does MOND have to say about that? According to the Big Bang theory, the universe began as a uniform singularity 13.8 billion years ago. And, just as in galaxies, observations made of the cosmic background radiation from the early universe suggest that the gravity of all the matter in the universe is simply not enough to form the different patterns we currently see, like galaxies and stars, in just 13.8 billion years. Once again, dark matter was called to the rescue: It does not emit radiation, but it does engage visible material with gravitation. And so, starting from the 1980s, the new cosmological dogma was that dark matter constituted a staggering 95 percent of all matter in the universe. That lasted, well, right until the bomb hit us in 1998. It turned out that the expansion of the universe is accelerating, not decelerating like all of us originally thought. Any form of genuine matter, dark or not, should have slowed down acceleration. And so a whole new type of entity was invented: Dark energy. Now the accepted cosmology is that the universe is made up of 70 percent dark energy, 25 percent dark matter, and 5 percent regular matter. But dark energy is just a quick fix, the same as dark matter is. And just as in galaxies, you can either invent a whole new type of energy and then spend years trying to understand its properties, or you can try fixing your theory. Among other things, MOND points to a very deep connection between structure and dynamics in galaxies and cosmology. This is not expected in accepted physics. Galaxies are tiny structures within the grand scale of the universe, and those structures can behave differently without contradicting the current cosmological consensus. However, MOND creates this connection, binding the two. This connection is surprising: For whatever reason, the MOND constant of a0 is close to the acceleration that characterizes the Universe itself. In fact, MOND’s constant equals the speed of light squared, divided by the radius of universe. So, indeed, to your question, the conundrum pointed to is valid at present. MOND doesn’t have a sufficient cosmology yet, but we’re working on it. And once we fully understand MOND, I believe we’ll also fully understand the expansion of the universe, and vice versa: A new cosmological theory would explain MOND. Wouldn’t that be amazing? What do you think about the proposed unified theories of physics, which merge MOND with quantum mechanics? These all hark back to my 1999 paper on ‘MOND as a vacuum effect’, where it was pointed out that the quantum vacuum in a universe such as ours may produce MOND behavior within galaxies, with the cosmological constant appearing in the guise of the MOND acceleration constant, a0. But I am greatly gratified to see these propositions put forth, especially because they are made by people outside the traditional MOND community. It is very important that researchers from other backgrounds become interested in MOND and bring new ideas to further our understanding of its origin. And what if you had a unified theory of physics that explains everything? What then? You know, I’m not a religious person, but I often think about our tiny blue dot, and the painstaking work we physicists do here. Who knows? Perhaps somewhere out there, in one of those galaxies I spent my life researching, there already is a known unified theory of physics, with a variation of MOND built into it. But then I think: So what? We still had fun doing the math. We still had the thrill of trying to wrap our heads around the universe, even if the universe never noticed it at all.